Adding a red dot sight to your hunting or shooting arsenal will improve your accuracy and speed. It will allow you to pin targets more efficiently and accurately than an iron sight, and many red dot sights are also more effective at improving speed and accuracy than some advanced magnified optics. Optics provide exceptional benefits to shooters and hunters alike. Without their help, constantly shifting focus between your target and the front sight of your weapon can be extremely taxing. Even many experienced shooters rely on a red dot sight to achieve accurate hits. Our list of the Top Ten Red Dot Sights will help you identify which is best for the specific type of hunting or shooting you intend to do. Our Buyer’s Guide will also provide additional information about the most important factors to consider when shopping for a red dot sight. Largely defined by its ability to aid in target acquisition, the Bushnell Trophy TRS-25 red dot sight is the perfect scope for the autumn deer woods. It’s bright enough to hunt in thick forests and it offers a 1×25 red dot with Amber-Bright optics that makes it easy to distinguish between trees and critters. This sight also features a 3 MOA red dot, multi-coated optics, and a CR2032 battery. It is 100% waterproof, shockproof, and fog proof. It also boasts a mounting length of 1.1 inches and a total weight of just 3.7 ounces. 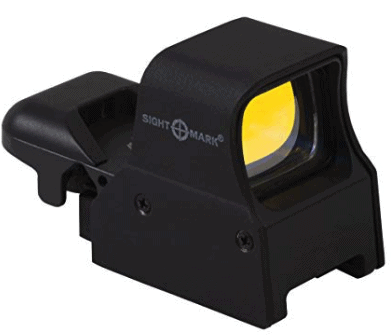 This multi-faceted reflex sight is designed to offer four sights in one. It offers a 33-millimeter sighting system for fast target acquisition and it also has an open design to allow shooters to remain aware of their surroundings. It’s a great sight for mounting to either your rifle or shotgun. The Feyachi reflex sight features a total length of 82 millimeters and a one-click MOA. The sight’s reticle allows for four distinct styles: dot, circle/dot, crosshair/dot, and crosshair/dot/circle. It’s also ultralight, waterproof, shockproof, and powered by one 3V lithium battery. This is an ultra-compact and lightweight red dot sight designed to help you get on target fast, regardless of whether you mount it on a flattop style rifle or shotgun. The sight’s digital rear-facing controls provide an easy way to power on and off, as well as adjusting the 2 MOA daylight bright red dot brightness at ten intensity levels. The Vortex Optics Sparc 2 features a rugged, single-piece body that’s machined from aircraft grade aluminum. It’s versatile, multi-height mount system accommodates most firearms (including AR-15s) that need absolute or lower third co-witness heights. It also mounts on standard Weaver or Picatinny bases, although these aren’t included. This red dot sight is built for longevity and ease. It’s always red, always on, and it’ll last up to three years on a single battery. It eliminates the need to fumble with an On/Off switch prior to use and it’s powered by one 3V lithium battery. 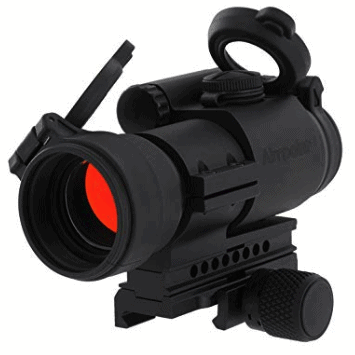 The Aimpoint PRO’s main operating principle is a reflex collimator sight with LED. It offers 1x optical magnification and a 2 MOA aiming dot size. It was designed with input from a distinguished group of current and former professionals, which makes it the ideal sight for the challenging conditions faced by modern law enforcement. A great sight for evening or night hunts, this guy is equipped with a night vision mode that allows users to mount it in front of a night vision monocular to create a co-witnessed setup. It also offers four reticle patterns that give you maximum ability to customize for day and night settings. The Sightmark Ultra Shot Pro Spec red dot sight was inspired by military and law enforcement technology. It’s designed for ‘Triple Duty’, which means it’ll meet your needs whether you’re hunting, competing, or in tactical situations. This sight features a quick-detach mount and a double-pane glass lens system that eliminates parallax. Offering the best in versatility on the market, this red dot sight can mount on handguns, shotguns, and hunting rifles with equal ease. It offers a convenient power button and three levels of brightness that can be changed to clearly display the red dot in all lighting conditions. The Burris Fastfire III allows you to forget about sight alignment, eye dominance, and the difficulties of target acquisition. It boasts a 3 MOA dot reticle and tool-less windage and elevation adjustments. This sight also features top of sight battery access and a low battery warning indicator. When it comes to battery life, it’s hard to compete against this sight. It offers 50,000 hours of battery life, which equals more than 5 years of continuous use. It offers a motion-awake sensor with an automatic shutoff after 8 hours of non-use. The HOLOSUN HS403A red dot sight is parallax-free and features a high-quality clear lens with crisp, bright red dot. It is constructed from high-strength aluminum with an MAO (1) finish and glass that’s designed to sit at an angle instead of flush with the bezel. It’s also fully waterproof and submersible up to 100 feet. The Trijicon RMR Type 2 red dot sight is a tough competitor designed for military, law enforcement, and hunting applications. It offers a button lockout featured that sets RMR (2) into an automatic mode in order to prevent accidental adjustments. This sight also features an automatic brightness mode and eight adjustable brightness settings. 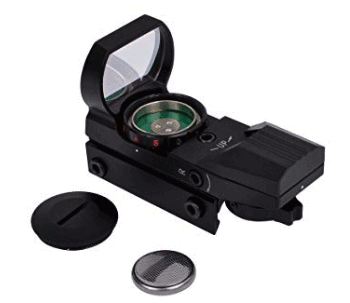 Its rugged battery contacts ensure performance in the harshest environments and a military-grade aluminum alloy forged housing diverts the force of an impact away from the lens. It also boasts a battery conservation mode that automatically adjusts the aiming dot to ambient lighting conditions after 16.5 hours. This red dot sight fits well on a rifle or shotgun and gives you optimal flexibility. It offers 1 MOA windage and elevation adjustments that make sighting a breeze. It also contains a top load system that means easy changing of the battery without removing the entire sight. 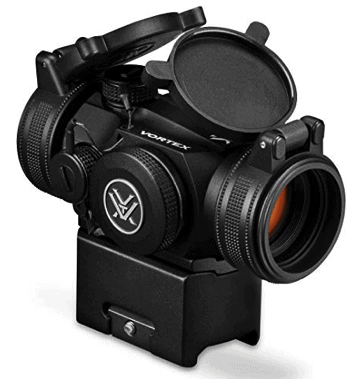 The Vortex Optics Venom features an auto-brightness mode that utilizes an ambient light sensor and high-quality, fully multi-coated lenses that offer a clean, wide field of view. Finally, it boasts power and dot intensity controls that allow you to choose between 10 distinct brightness levels. Twenty daylight brightness settings make this red dot sight adaptable to almost all environmental conditions imaginable. It runs easily on AA batteries but still offers all of the features you’ll find on most top-of-the-line sights. The EOTech Optics 518-2 easily mounts on a one-inch Weaver or MIL-STD-1913 rail. It is water resistant and submersible up to 10 feet while offering a battery life of 1,000 continuous hours at nominal setting 12. This new 518 version is also compatible with drop-in EOTech Battery Caps (3) that further enhance aim using visible and IR lasers. To put it simply, a red dot sight is a mechanism that provides the shooter with a holographic red dot that assists in aiming. Within the mechanism, a red-light-emitting diode (LED) reflects off an angled piece of glass, which, in turn, emits a bright, focused red point wherever you’re aiming (4). For beginning shooters, a red dot sight is a great way to accelerate your learning curve and shoot more accurately from the get-go. But when setting out to choose a red dot sight, make sure you consider the following factors: size, style, weapon and caliber, and battery type and life. Red dot sights come in a variety of sizes that are designed to fit with specific weapons. The red dot sight that’ll work best for your weapon will depend on the size and style of the weapon in question. More specifically, the available rail space on your weapon will dictate which red dot sights will be most compatible. It’s important to keep in mind how much space your optics will use, as well as whether you want to use the optics with any additional accessories. You may quickly take up all available rail space with a larger optics on a smaller weapon, which rules out the possibility of adding other accessories. Weight is also synonymous (in many cases) with size. Placing a heavy sight on a small weapon can render that weapon virtually useless for many scenarios. Always keep in mind that the ideal optics should enhance the efficacy of your weapon instead of taking away from its efficiency. There are two major styles of red dot sights: open or window-based designs and traditional, tube-like styles. Of the aforementioned sights above, Aimpoint (tube) and EOTech (open window) offer great examples of these distinct styles. In general, the open window design is more compact and low profile than tube-style designs. The open window design also tends to offers a wider field of view because there is less to interfere with your vision, especially when using both eyes to aim. Additionally, open sights tend to be less bulky and lighter in weight. In contrast, the tube-style design often provides more durability and protection for the optics it contains. Many tube-style sights are often more waterproof and capable of suffering more abuse than comparable open window designs. Battery type and life can vary incredibly between red dot sight manufacturers. One of the biggest issues that come with more exotic battery types is the availability of replacement batteries. CR123 batteries, for example, may not be available to you locally and can sometimes even be hard to find online. It’s also important to consider the batteries that other shooting accessories utilize. If you’ll be using multiple accessories with your rifle or shotgun setups, it can be helpful to consolidate to a single battery source so that it’s easier to purchase replacements in bulk. Longer battery life is, of course, desirable. However, competitive shooters will use their optics in a different manner than hunters, which means varying needs for battery life. In addition, optics that are put into use for military or law enforcement officials must come with batteries that offer outstanding life so that they keep the optics ready to use at a moment’s notice. 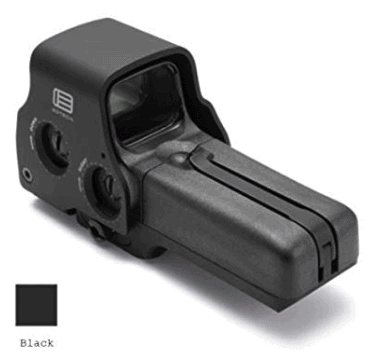 A red dot sight is a common classification for a type of non-magnifying reflector (or reflex) sight for firearms, and other devices that require aiming, which gives the user an aimpoint in the form of an illuminated red dot (5). A quality red dot sight will improve your ability to acquire targets quickly and hit them more accurately. Our list of Frequently Asked Questions will dive into some technical terms that apply to red dot optics and explore proper maintenance techniques. The dictionary definition of parallax is ‘the effect whereby the position or direction of an object appears to differ when viewed from different positions.’ In our case, parallax refers to an optical illusion that must be corrected. It describes a situation where the focal plane of the object in the scope is offset from the reticle. A ‘Minute of Angle’ (MOA) is an angular measurement. One ‘MOA’ is equal to 1/60thof a degree and spreads about 1” per 100 yards. It’s important to recognize that 1 MOA is a different size at different distances. For example, 8” at 800 yards is still just 1 MOA. 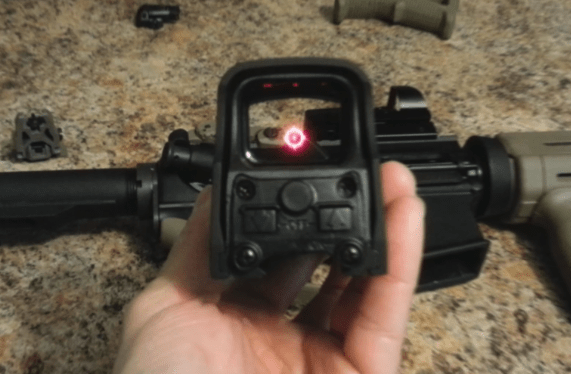 What’s the best way to clean a red dot sight? When we talk about cleaning a red dot sight, we’re mainly referring to the lenses. For starters, it’s widely believed that you should never use Windex or similar glass cleaners, paper towels, or soap to clean the lens of a red dot sight. In fact, the most acceptable method for cleaning your red dot sight is by using a lens pen. If you don’t have immediate access to a lens pen, you can white vinegar on a Q-tip or a Q-tip wetted with alcohol. What is a ‘lens pen’? A ‘lens pen’ is a small, lightweight, pen-shaped cleaning tool that’s specifically designed for camera lenses and other optics items. Most featured a concave cleaning tip that’s especially suited to the lenses of rifle scopes and sights. If you’re looking to improve speed and accuracy, it’s tough to argue against the benefits of a red dot sight for competitive shooters, hunters, and military or law enforcement officials alike. We hope that you’ve found this review of the Top Ten Red Dot Sights useful and we wish you the best of luck finding the sight that fits your needs.